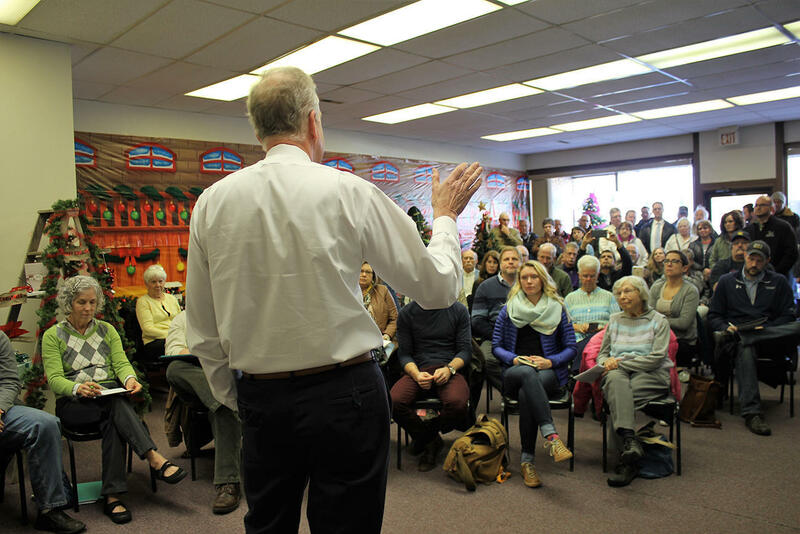 U.S. Sen. Jerry Moran, a Kansas Republican, discusses the tax cut bill with a crowd of about 100 people Wednesday in Frankfort, a north-central Kansas town. U.S. Sen. Jerry Moran candidly discussed his reservations about President Donald Trump’s tax cut bill last Wednesday at a town hall meeting in the small north-central Kansas community of Frankfort. But in response to prodding from some in the crowd of approximately 100, he declined to commit to voting against the bill if Republican leaders don’t address his concerns. Moran, a Republican, said he believes cutting corporate taxes would stimulate the economy. But he said he is opposed to massive cuts that would balloon the budget deficit and trigger automatic reductions in Medicare, agriculture subsidies and other federal programs. “Surely we can figure out how to have a tax plan that doesn’t go to the extent that we have ‘PAYGO’ rules kick in and across-the-board cuts come into play,” Moran said. The Congressional Budget Office estimates that the version of the tax cut bill recently passed by the U.S. House would trigger a $25 billion reduction in Medicaid funding and an overall reduction in federal spending of $136 billion in 2018. A plan by Senate GOP leaders to use the tax bill to repeal the Obamacare mandate that requires individuals to purchase health insurance is also a bad idea, Moran said. 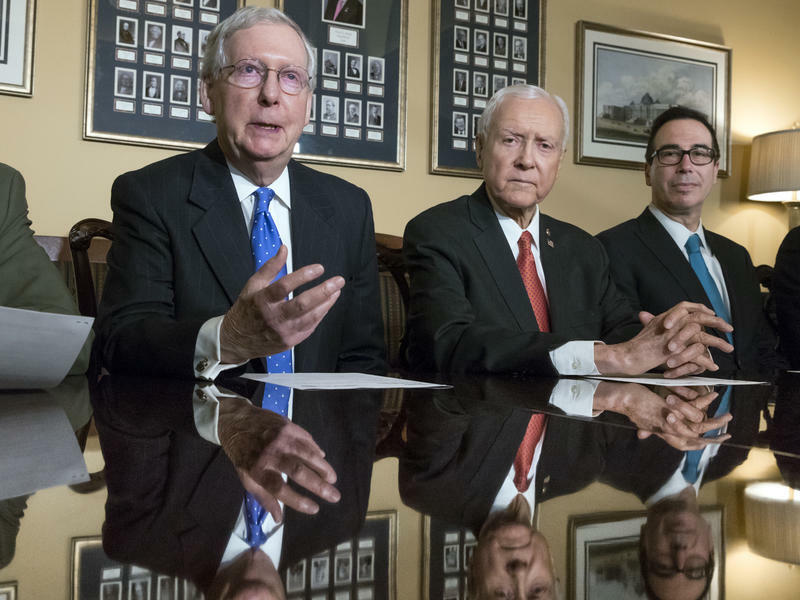 “I hope that we can get health care separated from taxes to start with,” he said, adding that he had “encouraged the leadership” to strip the Obamacare provision out of the bill. Some provisions in the House version of the tax cut bill also concern Moran. Among them: one that would tax as income the tuition waivers given in lieu of salaries to graduate teaching assistants at universities. “I will do everything I can to make sure that provision is not in there. Then I’ll make a decision about the overall tax bill, whether it’s a good thing or a bad thing,” he said. Wednesday’s scene was similar to one last summer when a large crowd showed up in the tiny northwest Kansas community of Palco to urge Moran to vote against the Senate’s Obamacare repeal bill. Jim McLean is managing director of KMUW's Kansas News Service, a collaboration of KMUW, Kansas Public Radio and KCUR covering health, education and politics in Kansas. Follow him on Twitter @jmcleanks. President Trump boasted earlier this month that Republicans were working together to pass sweeping tax cuts in the waning weeks of 2017. "We're working to give the American people a giant tax cut for Christmas," Trump said. "We are giving them a big, beautiful Christmas present in the form of a tremendous tax cut." But first, GOP lawmakers will have to resolve some major policy differences that could derail the bill. The White House is banging the drums that President Trump is doing something big again ahead of his 100th day in office — unveiling a tax "plan." 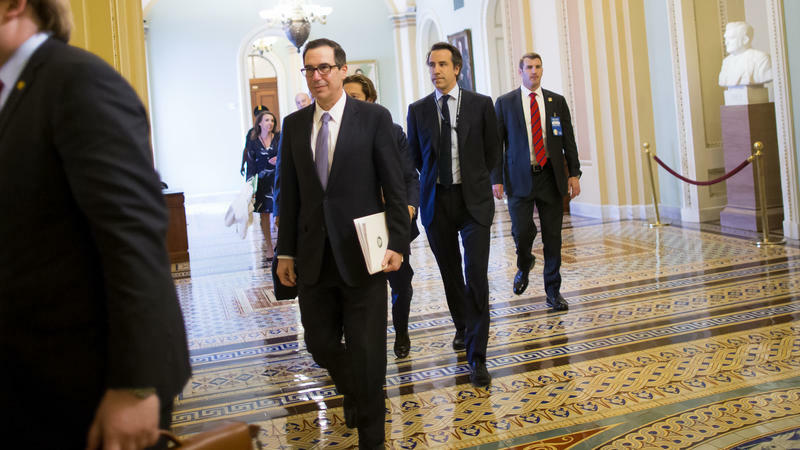 "This is going to be the biggest tax cut and the largest tax reform in the history of our country," Trump's Treasury Secretary Steve Mnuchin said at a panel Wednesday morning.